Lift kit designed especially for the John Deere Gator 825i and 825i 4 place UTVs. Higher clearance allows for larger front tires. Lift kit designed especially for the John Deere Gator 825i and 825i 4 place UTVs. Higher clearance allows for larger front tires. Installs easily and directions are included. This is a Front Lift only. Once installed your Gator will not have the nose down appearance that it has from the factory. This lift kit is NOT spring spacers. 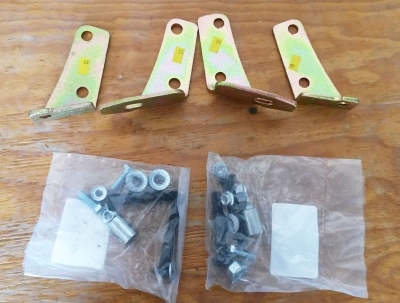 Lift kit consists of brackets that you attach to your frame and re-position your shocks to. This type of lift kit will not change your ride characteristics like spring spacers will.